All class related discussion is on Piazza , which is a Question & Answer system designed to get you answers from classmates and instructors fast. Ask questions on Piazza rather than emailing the teaching staff so everyone can benefit from the response. You have the option to participate both under your real name or anonymously. 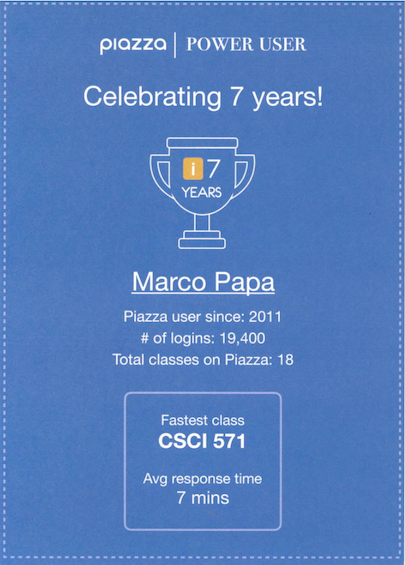 Enter the direct link http://piazza.com/usc/spring2019/csci571 to join the class. Alternativelu. 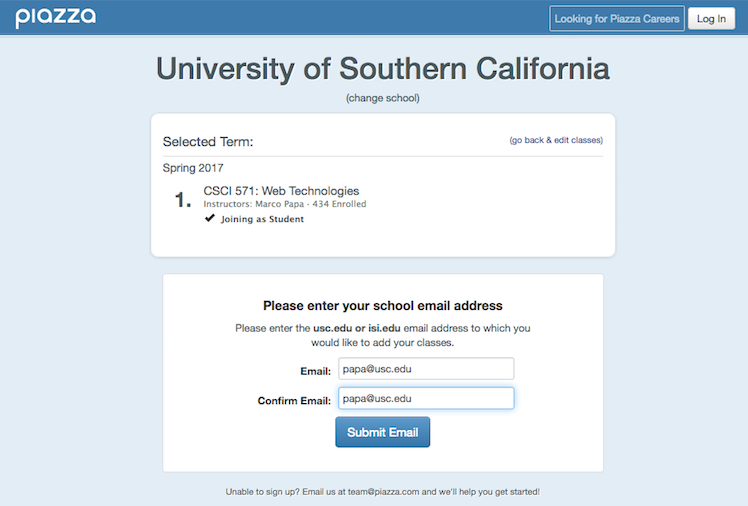 navigate to piazza.com, click Sign Up - Student Get Started, enter "University of Southern California" in the Search Schools edit box, select the first choice in the dropdown, select your term in the Select Term dropdown, enter "cs" in the Class 1 edit box, select "CSCI 571: Web Technologies" in the dropdown, click the Join as Student radio button, click Join Classes, enter your @usc.edu e-mail and e-mail confirmation, click Submit Email. Wait for a Validation code in your email client, enter code and click Submit Code. 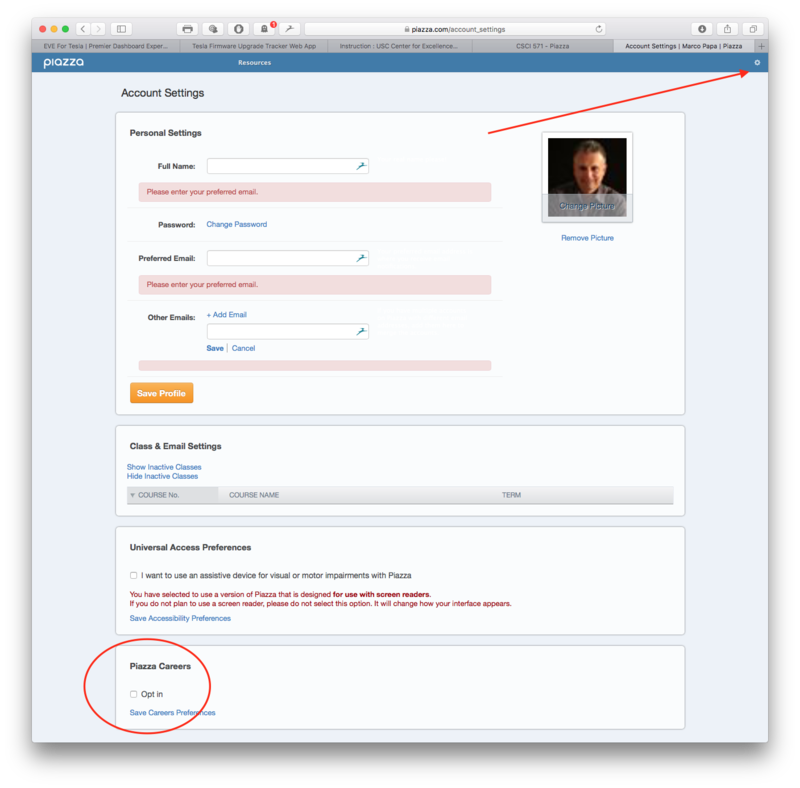 The first time you login you should be taken to the Set Up Your Piazza account dialog. Enter your data. Notice that under Piazza Careers the default is Sign me up. Please note that if you leave it "checked", Piazza may sell your student information to prospective employers. Our recommendation is to "uncheck" the box. 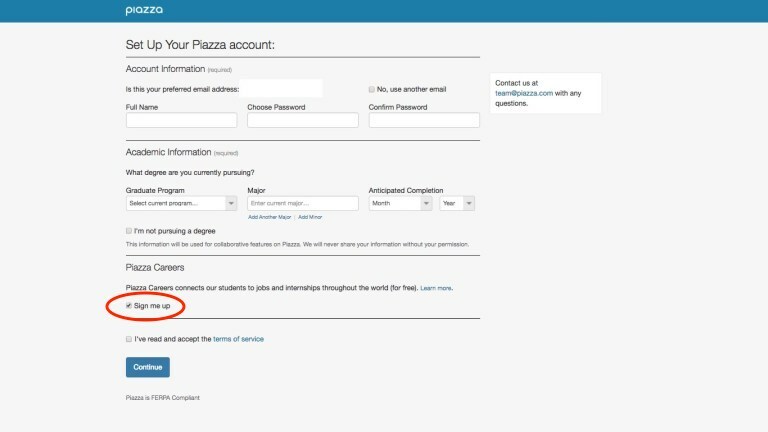 If you forget to unckeck the box, and you want to do it after having created your Piazza account, login to Piazza, click the Settings wheel, select Account/EMail Settings and uncheck the Opt In box.